HRsuccessmantra: Why does performance appraisal induce anxiety & fear? Why does performance appraisal induce anxiety & fear? Having been part of HR fraternity for quite some time, I keep wondering if much feted performance management system is serving the purpose they were built to serve across the industry. While I agree there may be pocket of excellence - some organization doing it better than others. I have not seen too many Managers who would refer to last year development plan wherein they would have had a stake to enable development of an employee while kick-starting the discussion for the current appraisal. 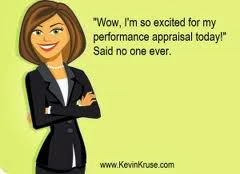 Last appraisal once done tend to become a history. I had an opportunity to appraise the performance appraisal of large number of employees and see how smartly the goals are set - are they measurable, time bound, realistic and to my utter dismay and surprise, majority of the objectives were more like activities without having measurement around them. When discussion take place on such obscure goals, life become difficult for managerial community as they are asked to Force Rank people to arrive at pre-set curve i.e Top 20%, Solid 70%, Needs Improvement - 10%. This will vary from organization to organization, some will have 3 level ranking, some will have 4, some will have 5 and %age to fit in the curve will also differ. Case No. 1 : Mike is a successful Trainer at Company X. His five-year performance record is exemplary. He is the highest rated trainer in his large team. When it came to performance appraisals, Mike enjoyed the complete confidence of his former Manager. Appraisals were informal and pleasant – a yearly housekeeping matter that lasted less than 30 minutes from start to finish. But, all this changed when Mike Manager left the organization. His face to face discussions with his new Manager were minimal, however, Mike remained un-alarmed given the absence of developmental feedback and complaints. Even when the new performance planning and review system was announced, he was at ease as he had no cause for concern basis his past performance and current delivery and reputation that was impeccable. Entering into his new Manager’s office on the day of his appraisal, he felt secure at first, knowing he dutifully completed his self-evaluation and performance goals. After a few opening pleasantries, the Manager handed Mike the completed appraisal and began to sell his assessments on each performance dimension without inviting Mike to comment or provide input. There was no mention of his self-appraisal or development goals. He received an overall satisfactory rating with two documented incidents by disgruntled trainees for poor course organization and delivery. Mike was extremely pissed off and sat in stunned silence as the remainder of the appraisal was read without mention of his past years of loyal service and successful job performance. He was assigned new performance goals and standards, including a 25 percent increase in classroom contact, and recommended a three percent raise – the lowest of his five years with the company. What rating I will get after year of hard and sincere work? Will my manager be biased to my peers? How much increment I will get? Should I agree or disagree with the rating and face consequences accordingly? Is this Performance system fair and transparent? Will my role change impact my performance rating. Well, this is not the case of only Mike or Daisy. This is quite common in corporate world where we are appraised half yearly or annually. This brings us to the questions as to why performance appraisal which should have help employee develop and get better and hence contributing in increasing organizational vitality has become a tool which creates fear and anxiety amongst large section of employees. In my next post, I will touch upon the reasons as to why employee dislikes Performance Appraisals. Watch out the space! Thank you for the informative information. - Effective performance appraisals add value to your organization. They motivate your top employees to do even better. And they tell under-performers exactly what is expected and how to improve. Unfortunately, performance appraisals are often regarded as mere formalities. Performance reviews are sometimes administered late—or skipped altogether. Clear guidance falls by the wayside, and halfhearted work goes unchallenged. A Wonderful article on 'Why does performance appraisal induce anxiety & fear' . Depression comes in a small reason and its very difficult to reduce. Yoga, Exercise, aroma therapy, Meditation help a lot to recover fron it. I do yoga and normal without weight exercise regularly. After that I lights two three Cycle sandal agarbatti and start meditating. The Sandal smell helps a lot to concentrate. I feel all the people need to do Yoga, meditation to rejuvenate mind and keep depression in bay.